Leverage is when someone is borrowing money from their stock broker in order to open a bigger position than their cash account allows. In day trading leverage is 4 times the cash balance and in swing 2 times. So a cash account of $20.000 can open long or short positions of $80.000 in day trading and of $40.000 in swing trading. By leveraging the position someone can gain more than they could based solely on their cash balance, but they can also lose more. Especially in swing, things can get really bad if we are leveraged and a gap occurs contrary to our position. In that case someone might lose much more than their initial capital, depending on the magnitude of the gap. 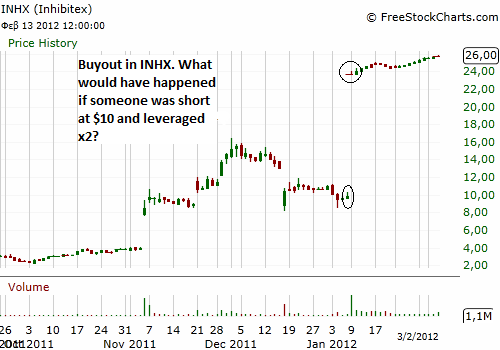 Below is the daily chart of INHX, a small pharmaceutical company which has been bought by a larger one. It closed at $10 and it opened the next day at $24 an almost 150% advance. If someone had a short position with 100% of their capital, let’s say $20.000, they would have lost $30.000. This is a total loss of the initial capital of $20.000, plus $10.000 that they would have owed to the stock broker. Even worse, if someone was short and leveraged x2 they would have lost 300% of their initial capital. This is the initial $20.000 plus $40.000 that they would have owed to their stock broker. Buyouts are quite often in US stock exchanges especially in pharmaceutical companies, although without a premium of 150% like in the case of INHX. To avoid such incidents there are certain risk management rules that must be followed strictly.